To be published in September, “AGONY WALK – On the road with Sentenced” is a unique 100-page picture book about a band that loved playing shows but hated touring. Drummer Vesa Ranta captured the daily life of his group into photos during the years 1995 – 2003, when the band was most actively touring the world. The pictures of the book illustrate the group’s tale and allow the viewer to witness situations that the fans were otherwise unable to see. Ranta became a trained, professional photographer when Sentenced was active. He has already published two books, “Lottovoittajien pöydässä – Tarinoita köyhyysrajan taka” (2017) and “Reunalla – Tarinoita Suomen tyhjeneviltä sivukyliltä”(2018), the latter of which received the Botnia Award. 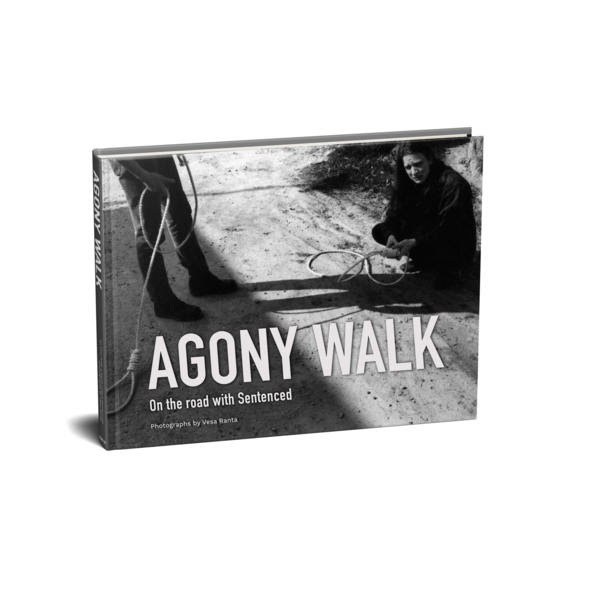 “AGONY WALK – On the road with Sentenced” is the first pure picture book by Ranta. The book contains the author’s introduction in Finnish, English and German. ”This is my personal, illustrated testament about the journey of our group. While I was going through my photo archives, I realised that these pictures deserve a life also outside my negative sleeves that were already gathering dust. I believe that the book will have something to offer to the people who have faithfully followed us on our path. These images will help the viewers understand what it was like to be on the road as a group. They store a little piece of Finnish rock history, too,” Ranta explains. The release date for the book is 02 September 2019. Pre-order issuers will receive an authentic signed photo with their copy. The book is published by Ranta’s own company, Western Siberia Media House, which is an exclusive retailer available both in Finland and internationally through its online store is Levykauppa Äx, the leading chain of record stores in Finland. A limited edition is now available on pre-sale, which you can check out HERE! Don’t forget to get a glimpse of Vesa’s work HERE!